Real Christmas Trees are a benefit to the environment. Our Christmas trees are grown for your enjoyment. We plant 2-3 seedlings every year for every tree that is harvested. During its growing years, the tree cleanses the air, provides you with oxygen, protects your water supply, makes a home for wildlife, and beautifies some previously barren land. In addition, the wood from trees insulates us from the cold and protects us from the heat. Artificial trees are a petroleum-based product manufactured in Chinese factories. On average, American families use an artificial tree for only six to nine years before throwing it away. The artificial tree remains in the landfill for centuries after disposal. If you celebrate the holidays with a Christmas tree, a Real tree is the more responsible choice. FRASER FIR: The Fraser Fir is a beautiful Christmas tree. The needles are flat and short and have round tips. The dark green color and pleasant aroma make this tree a favorite. The needles will remain on the tree through the Christmas season. 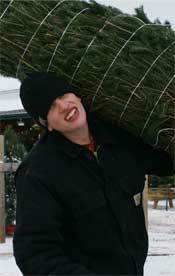 BALSAM FIR: The Balsam Fir, a native of Wisconsin, is a truly superb Christmas tree. It has short flat needles with a rounded tip. It’s lovely green color and fragrant, fresh cut aroma makes it one of the most desirable trees on the market. WHITE PINE: The White Pine is an excellent Christmas tree. It is the tree that made Wisconsin famous in the old logging days and is a native of Wisconsin. The soft long needles that have a blue green color with just a hint of white make this tree a favorite of pine buyers. The White Pine retains is needles throughout the Christmas Season. BLACK HILLS SPRUCE: Spruce are found mostly in cold climates. The Black Hills Spruce has darker blue-green colored needles. The needles are short, stiff and sharp. The strong branches are excellent for holding all the Christmas ornaments. To keep your real Christmas tree fresh, make sure to give the tree a fresh cut before putting it in your stand. If you have our No-Hassle drilled tree stand only cut off less than a ¼ of an inch otherwise the tree taper will be affected and the tree will not stand straight. Water your tree frequently. Plain water is the best for a tree; you do not need to add anything to the water. A fresh cut tree may drink several gallons of water per day!! Always keep the tree away from heat sources.